The first 12-micrometer film of nickel is nonmagnetic and is intended to improve the surface of the aluminum substrate. Nickel is highly polishable and provides a hard, clean metal-to-metal bonding surface for the iater magnetic plating. Several hundred disks are processed simultaneously. The baths are sampled every few minutes to analyze bath chemistry, which is automatically adjusted by the computer based upon real-time analysis of the sample data. Disks are loaded into cartridges, which then go into the polisher, where both sides are polished by a diamond slurry. Polished surfaces have a typical peak-to-valley finish of less than .0625 micrometer. Designed to the stringent requirements necessary to clean silicon wafers in the microchip industry, this automated scrubber removes polishing residue from the disks. At this robotic work station each disk goes through an optical scanner to check for surface defects before entering the critical magnetic plating process. The disks are electrolytically plated with a film of cobalt/nickel/phosphorous .075 micrometers thick. A specially designed dedicated robotic unit loads and un­loads the plating tools used in the line. This proprietary plating process is tied into its own real-time, computer­controlled chemical analysis system. 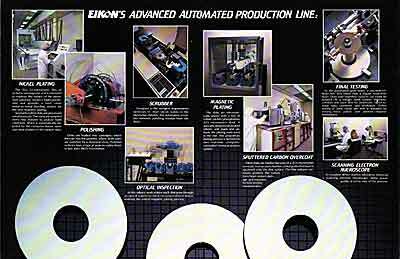 Eikon disks are hardier because of a .075 micrometer overcoat. In a vacuum chamber, a final protective layer is sputtered onto the disk surface. This film reduces corrosion, protects the surface from head contact damage, and improves friction/stiction characteristics. In the automated glide tester. a piezoelectric head flies 30% lower than a regular read/write head. Disks with imperfect surfaces can easily be isolated. At a robotic work station. electronic certifiers test each disk for amplitude, signal-to­noise ratio, overwrite, and resolution. Defect testing of 2000 tracks per inch is standard for missing/extra pulses and positive/negative modulation. A complete defect analysis laboratory, featuring a scanning electron microscope, helps assure quality at every step of the process.